What’s better than reading about a teenager moving to the other side of the world? You guessed it, it’s reading about a teenager moving to the other side of the world, and discovering they have magical powers! And Oksa’s eyes are opened to the Magic all around her. But powers aren’t always used for good, and this new world Oksa has discovered will cause more trouble than one person should have in a lifetime. Oksa’s new school is all kinds of different, with a uniform giving Oksa nightmares of dancing blazers, the prettiest history teacher in, well, history and a sinister chemistry teacher. Oh, and not to mention the maths teacher was found dead in the Thames late last year. This creepy new school is filled with obstacles to overcome, such as a massive bully out to get Oksa. But Oksa is nothing if not brave, so Ninja Oksa-san will just have to tough it out. I received this book a while ago and started reading it, but it just didn’t hook me in. I restarted it after a while and found it better than I remembered. I would probably rate it 3.9 stars (out of 5 ). The age I would recommend would probably be 12-14, because it suits slightly older readers. Overall it was an okayish-good book, and I would read the next one. 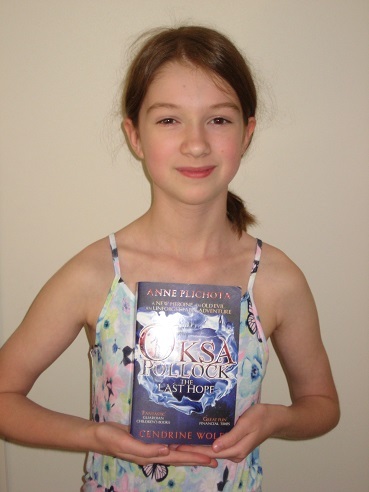 Thanks for reading my review, and I hope you enjoy Oksa Pollock: The Last Hope!